The remains of several unknown insect species, extinct even before dinosaurs died out, were discovered in pieces of 110-million-year-old amber found in Spain. Palaeontologist Enrique Penalver said the amber discovered in the El Soplao cave in the northern province of Catabrina and was in “exceptional” condition. An insect found in amber. Amber is tree sap or resin that is fossilized after millions of years. Often insects or other debris becomes embedded in the resin after becoming stuck there in life. Several types of arachnids, as well spider webs and plant remains, were among the fossilised remains in the amber discovered at the site. It is the most important amber find to date in Spain and possibly in all of Europe, he added. There are only few other amber finds from that era in the world, so the magnitude of this find is huge, as it allow scientists to learn more about that early point in life on Earth’s history. 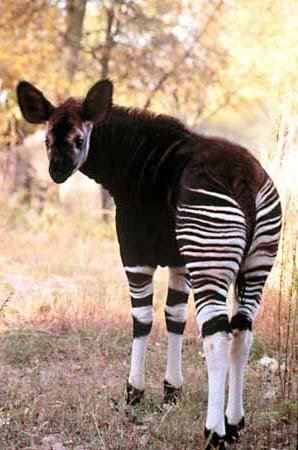 The Okapi or Okapia johnstoni is a mammal living in the Ituri Rainforest located in the Democratic Republic of the Congo of central Africa. Although this fascinating creature has markings that certainly resemble those of zebras, it is evolutionarily more closely related to the giraffe. The similarities to giraffes do not end at genetics, however. The okapi has a body shape much like that of their taller friend. Also, they have a very long (1 foot), blue tongue, which it actually uses to clean its ears and eyes (not surprisingly, this is almost a singular occurrence in the animal kingdom). The tongue is also used to strip leaves of branches of low-lying trees, shrubs, and bushes. The okapi is largely diurnal, coming out only at night, and then coming together in pairs only to mate. This was one of the difficulties in actually finding and officially identifying it as a real, new species. For a long time, the okapi was a species known to cryptozoology — the study of animals not wildly recognized by science — as the African unicorn, rather than real zoology (Somebody is going to be angry at me for saying that, but too bad. Get undoctored photographs and some DNA evidence of bigfoot and I will believe you. Until then, you are little more than ghostbusters to me.). First clues as to its existence were announced to Europe by Henry Morton Stanley (“Dr. Livingston, I presume), who found some cloven-hoof tracks and heard tales of a jungle donkey from the Africans themselves. Later, a skull and some skin were given to Sir Harry Johnston at the beginning of the 20th century. Later, the species was formally recognized in 1912. Although not endangered, the okapi are threatened due to poaching and deforestation. The war in the Congo is not doing any favors for the wildlife (okapi, gorillas, all living things suffer). Hopefully, they will survive to see peace. 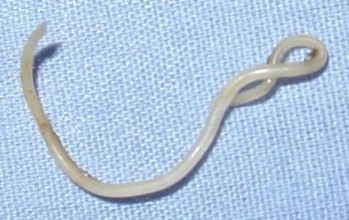 Roundworms use their senses of taste and smell to navigate in their environment through taxis, a directional movement to or away from a stimulus. Now, researchers may have found how a worm’s brain does this: calculus. Is this worm doing Calculus right now? Worms calculate how much the strength of different tastes is changing (the same as taking a derivative in calculus (the derivative of y=x^2+4x-5 is y=2x+4)) to figure out if they are moving toward food or should change direction according University of Oregon biologist Shawn Lockery, who believes humans and other animals do the same thing. With the aid of salt and chili peppers, Lockery reached the calculating-worms conclusion by studying two anatomically identical neurons from the worm’s brain that collectively regulate its behavior. These two neurons function like “on” and “off” gates in a computer in response to changes in salt concentration levels. Like human visual systems that respond to the presence and absence of light, Lockery and colleagues found that when the left neuron fires as salt concentrations increase, the roundworm continues crawling in the same direction. The right neuron responds when salt concentrations decrease, and the worm turns in search of a saltier location. Lockery said this is similar to a game of hot-and-cold. However the worm calculates if it needs to go closer or further by itself. Observing the worm responding to changes in concentration suggested an experiment to see if the worm’s brain computes derivatives. The mathematical concept of a derivative indicates the rate at which something, such as salt concentration, changes at a given point in time and space. So Lockery tried to verify that these neurons recognize changes in salt concentration and then tell the worm where food is and where it is not. To do so, he artificially activated each neuron with capsaisin, the chemical that makes hot peppers spicy. Worms normally do not natrually detect the chemical compound. Worms with capsaicin applied to the left neuron crawled forward. When the worm’s brain indicated that the current direction of movement lead to increasing salt concentrations, it continued moving in its original direction. But since the worm’s right neuron was activated with capsaicin, it is fooled into thinking the salt levels are decreasing. So the worm changed direction, hoping to find salt elsewhere. Previous studies have identified “on” and “off” cells in the brains of other chemosensory animals such as fruit flies, cockroaches, frogs, lobsters and rats. As a result of the strong similarities between these regions, more animals could be doing calculus to find food. This could help the many Americans who cannot taste or smell, especially those with Alzheimer’s. The Northern (and Southern for that matter) Lights are now a bit less mysterious. It turns out that they are caused by explosions of magnetic energy between Earth and the moon, according to NASA. A network of five satellites on a mission known as THEMIS studied the phenomenon for a year to help gain this insight into the aurora borealis. The energy explosions that take place a third of the way between Earth and the moon power substorms which cause the sudden brightening and rapid movements of the northern lights. The substorms are caused by magnetic reconnection, a process that occurs when magnetic field lines around all matter quickly snap to a new shape. This releases energy stored in the stretched magnetic field lines, sending charged particles toward the Earth. 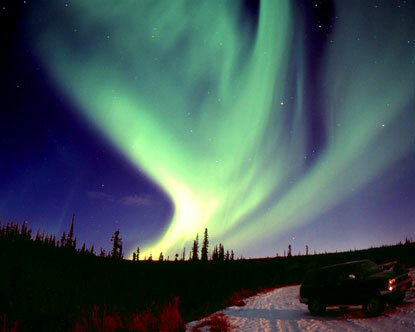 When these hit our atmosphere…boom the glowing lights at the poles begin to move in their dazzling, spectacular light show. For the past decade the search for a rare metal necessary in the manufacturing of Sony’s Playstation 2 game console has fueled a brutal war in the Democratic Republic of Congo. At the center of the conflict is the unrefined metallic ore, coltan. After processing, coltan turns into a powder called tantalum, which is used extensively in electronic devices including cell phones, computers and, of course, game consoles. The demand for coltan prompted Rwandan military groups and western mining companies to plunder hundreds of millions of dollars worth of the rare metal, often by forcing prisoners-of-war and even children to work in the country’s coltan mines. So, not only now do video games promote virtual violence, they also add to real-world evils as well. So why is the Sony Playstation the main point of this post? Well, after the huge consumer demand for the new Playstation 2, the most popular video game console in the world (140 million units sold), Sony required larger units of, you guessed it, tantalum, to fuel its massive output of electronic capacitors. This increase in demand skyrocketed the price causing more Congolese children to go into the coltan mines. Sony claims that current builds of the Playstation consoles are sourced from a variety of mines in several different countries. I therefore, now support a boycott of all Sony appliances, especially of Playstation products until this travesty is stopped. Authorities in northeastern India have asked the army to help protect endangered one-horned rhinoceroses from poachers. The soldiers have been made honorary wildlife wardens. They will patrol Kaziranga National Park. The soldiers will live in tents in the park while on patrol, which will be done fully armed. The 267 square mile park is home to more than 1,800 of the world’s estimated 3,000 one-horned rhinoceroses. Poachers killed about 20 rhinos in the park last year and six have been killed so far this year. Gangs of armed poachers kill rhinos for their horns, which many believe have aphrodisiac qualities and are used in medicines in parts of South and Southeast Asia. Rhino horns are also popular in the Middle East, where they are fashioned into handles for ornamental daggers and scimitars.The army’s presence is expected to be a huge deterrent to poachers. Soldiers have also been asked to be part of anti-poaching campaigns in six other national parks and sanctuaries. Previous to this action, the government deployed lightly armed forest guards, who were unable to stop the poaching problem.